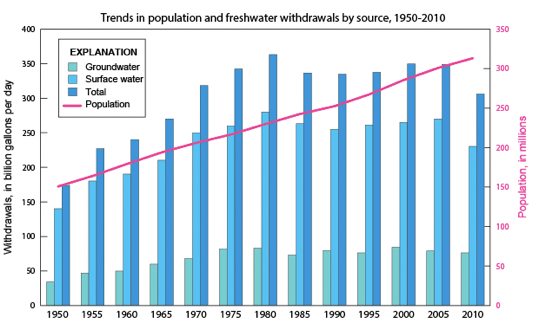 By 2050, water demand will have increased by 50%. Nearly half of the world population is projected to live under severe water stress because of climate change (OECD, 2011). As a matter of fact, the competition to extract water before it runs dry will intensify, as this natural resource will become scarcer and scarcer. The conventional wisdom is that this competition will threaten states’ security and lead to the emergence of a new kind of wars: wars over water. This view is summarized by Ismael-Dixon, the former World Bank’s Vice President for Environmental Sustainable Development, who said: ‘Wars of the next century will be over water’ (Homer-Dixon, 1995). Security can be defined as the protection of what a society values the most, such as its territorial integrity or its independence (Baldwin, 1997). Consequently, I define a war as being an armed response waged by a state because of a perceived threat on its security. I assume that this threat on security can correspond to the militarization of a neighbor country but also to the incapacity of a state to access enough natural resources to meet its own needs. This paper attempts to show that the conventional wisdom is flawed. It explains that inter-states conflicts over water will not multiply in the future, by examining the numerous requirements needed for these conflicts to break out and the possibility for cooperation. Nevertheless, it will argue that intra-states wars over the mismanagement of water, rather than water alone, will increase because of the unfair distribution of this vital resource among the population of a given state. Why will the mismanagement of water trigger a multiplication of intra-state conflicts while the increasing scarcity of water will not affect inter-state wars? This essay is structured in three major parts. The first one tries to present the arguments of the conventional wisdom according to which the increasing scarcity of water will lead to the emergence of numerous conflicts over this resource. Then, the second part will put forward different arguments, like the fact that predictions on the use of water have often proved to be wrong in the past or the possibility for states to cooperate over water, to show that the conventional wisdom is flawed. Finally, I argue that the multiplication of intra-state conflicts will occur over the mismanagement of this resource rather than over scarce water. I- The conventional wisdom: a decreasing global water supply will lead to the emergence of numerous wars over this resource. People generally regard June 5 1967 as the day the Six Day war began. That is the official date. But, in reality, it started two-and-a-half years earlier, on the day Israel decided to act against the diversion of the Jordan. While the border disputes between Syria and ourselves were of great significance, the matter of water diversion was a stark issue of life and death. Lasserre underlines the fact that one of the major seizures of Israel from Arab Countries during the War was the Golan Heights, which gave the Israeli state influence over Yarmouk and Jordan rivers (Lasserre, 2011). Therefore, it seems that the Six Day war could qualify as a war over water control, triggered by the increasing scarcity of this natural resource. Consequently, wars over water are feasible. This paper now moves to the study of future potential wars over water. Water is the trigger, through an economic chain of reactions, of a security dilemma pushing states to arm, and threatening peace. The first and quickly occurring consequence of the increasing scarcity of water is the degradation of natural ecosystems. As a matter of fact, crops will not be as good as before, which will weaken the agricultural sector and engender food crises, since the agro-industry will then be able to meet the demand for food. Consequently, competition for water will emerge between companies and states, triggering a security dilemma: since no one can be sure that the others will use the water in a sustainable way, everybody will start carrying large supply projects for their nation (Waughray, 2011). Brzoska finds empirical evidence of a move from a tragedy of the commons to a security dilemma, by analysing the increase in security and threat vocabularies related to climate change in security policies reports (Brzoska, 2012). His study shows that an increasing number of countries associates climate change with words like ‘danger’, ‘growing threat’ or ‘major threat’. Moreover, he shows that, in the last decade, the most often cited mean to counter this increasing threat to security turns out to be ‘military strength’. Consequently, it seems that water is triggering a global security dilemma that might lead to water conflicts. In the next section, this paper will study a region where such conflicts could potentially emerge. Inter-state conflicts over water might outbreak in a near future. As Homer-Dixon underlines, an armed conflict between Sudan, Egypt and Ethiopia can possibly happen in the next decades. Even though Egypt is highly reliant on the water it pumps out of the Nile, since 90% of its supply of water comes from the river (Mayton, 2010), the country often uses diplomacy in the first place to try to get a stable access to this water supply. In 1959 for example, Egypt signed a bilateral agreement with Sudan, giving the latter right to pump out from the Nile a defined amount of water per year. Therefore, why would a conflict over water occur in this region? For a long time, Egypt has been aggressive about its water supply. In 1979 for example, President Sadat said that ‘the only matter that could take Egypt to war again is water’, with an eye on the Ethiopian’s yearning for the Nile’s water (Kameri-Mbote, 2007). Moreover, Egypt and Sudan’s bilateral relations deteriorated in 1991, after Sudan accepted to sign a cooperation treaty on the use of the Nile’s resources with Ethiopia. Ever since, negotiations for the Nile River Basin Cooperative Framework Agreement with all 10 countries on the banks of the river reached a standstill. Moreover, although Egypt claimed its right to veto any project on the river undertaken by upstream countries, Ethiopia has kept on building new dams, increasing the tensions in the region and the militarization of the Nile (Homer-Dixon, 1995). Overall, this paper showed so far that conflicts over water did take place in recent history and that such wars could happen again in the future, as the study of the tensions in the Nile Valley show. However, this paper will now show that such conflicts are not likely to occur in the next decades. II- Inter-states conflicts over water will not take place to the extent commonly believed. For several reasons, the proliferation of conflicts over the control of water does not seem to be plausible. First, experts predicting the multiplication of wars over water base their analysis on projections about the evolution of the demand of water for the next decades. However, these predictions often proved to be a posteriori wrong (as shown in Figure 1). Moreover, technological progress was able to diminish the amount of water pumped out of rivers per inhabitant in the US (as shown in Figure 2). Source: Peter Gleick, ‘The changing water paradigm’, The World’s Water: The Biennial Report on Freshwater Resources 1998-1999, Island Press, Washington, 1998, 10-14.; Peter Gleick, ‘Picture of the future: A review of global resources projections’, The World’s Water: The Biennial Report on Freshwater Resources 2000-2001, Island Press, Washington, 2000, 48-59. Such technological changes could be applied to regions where tensions arise around water. As shown before, Egypt is one of the countries that could potentially launch a war over water in the Nile Valley. However, 13% of its land is irrigated through a drip system while 75.6% is irrigated through surface irrigation. Consequently, over 70% of the crops receive too much water (Lasserre, 2011). A generalization of the use of drip systems could therefore diminish the demand for water and the tensions in the region. Furthermore, the causal link between water shortage and war seems questionable since Kenya and South Africa, two countries under water stress according to the Water Stress Index, does not seem close to face civil wars or to declare war to their neighbors (Alao, 2007). B- Inter-state conflicts on water are not likely to increase exponentially in the future since they require many preconditions that are hard to meet. According to a study of 412 international crises all along the 20th century, only 7 of them involved water issues and none were violent in terms of deaths (Wolf, 1999). Indeed, many conditions must be met in order for a conflict between two countries using the same river to outbreak (Homer Dixon, 2001). First, the downstream country must be highly reliant on this river. Then, the upstream country must be threatening to restrict water access to the downstream country. Moreover, an history of antagonism must exist between the two countries. Finally, the downstream country must believe that it is militarily stronger than the upstream one. Homer- Dixon then emphasizes that such conflicts may outbreak during the 21st century in the Nile Valley for example but that, they will remain seldom because of the criteria stated above. Another reason why I argue that water conflicts will not arise exponentially during the 21st century is that cooperation over water is possible even between weak states. I define here cooperation as being the opposite of war and conflict: it is a peaceful way to resolve a problem between two states. Cooperation can take place through informal talks between diplomats but also thanks to the creation of international organizations. Water regimes can succeed in preventing conflicts even when there is strong antagonism between actors. I define a water regime as a set of rules designed to reduce the conflict potential caused by the use, pollution or division of a given water resource (Haftendorn, 2000). In Southern Africa, which encompasses all the member states of the Southern Economic Community, several factors explain why the outbreak of a conflict over water seemed plausible at first at the end of the 20th century. First, according to the World Bank, countries in the region needed an annual economic growth rate of 5% to reduce poverty, whereas they only grow by 1-2% now (World Bank, 2000). According to Granit (2000), this lack of development can be explained by the water scarcity these country face. Therefore, water is a pivotal factor for their economic development, which explains why conflicts seemed plausible at the time. Secondly, states within this region are historical rivals. Hostility is particularly polarized between South Africa and its neighbors for several reasons, such as its former racist Apartheid regime or its ‘colonial’ influence on Namibia (Turton, 2004). Therefore, the probability for an armed conflict to break out during the last decades of the 20th century seemed high at first glance. However, such a war did not take place. This can be explained, to some extent, by the creation of water regimes in the region. Cooperation over the Orange River Basin is a good example of a water regime that succeeded in coordinating states’ riparian actions and in eliminating the security dilemma water exploitation could have triggered. The Orange River is in deficit and consequently Namibia, one of its riparian state, could not expect many opportunities for development from it without either drying it or fighting for larger volumes of water. However, neither of these scenarios occurred. In 1987, Lesotho and South Africa signed the Lesotho Highland Water Project which aimed at diverting water from the Orange River to deliver water to the Vaal River System in South Africa. Namibia felt threatened by this agreement and pressed South Africa to establish a basin-wide regime. After 10 years of negotiation, the four riparian states of the Orange River joined the Orange-Senqu River Commission (ORASECOM). Different aspects of this commission show the commitment of these states to a relatively deep cooperation instead of escalating into armed conflicts. The first of them is the fact that Botswana also joined the ORASECOM, although it has no access to this basin. It makes of this country the balance of power of the agreement. Indeed, in order for Botswana to gain political support from the same member states in negotiations for the management of other water basins, it has to play the role of referee within the ORASECOM (Turton, 2004). Then, a second important aspect of this commission is that it refers to the SADC protocol which defines concepts such as ‘equitable and reasonable’ and ‘significant harm’ and which sets a Dispute Resolution Mechanism to find peaceful solutions to conflicts over water (Ramoeli, 2002). Therefore, the Southern African case is an example showing that water can create cooperation and regional integration. Since Haftel (2007) says that cooperation is a factor for peace, it can consequently be argued that conflict over water can be avoided thanks to the creation of international organizations to mitigate conflicts. Overall, this second part of the paper developed several counter-arguments to the conventional wisdom: the exponential growth of the number of conflicts over scarcer water is not likely to occur. In its last part, this paper will discuss the definition of conflict over water and move to the use of the terms ‘conflict over mismanagement of water’ which better fit to explain the ongoing increase of conflicts related to the unfair distribution of water. III- Intra-state conflicts would presumably increase in the next decade, not because of water scarcity, but because of its mismanagement. According to Lasserre, water conflicts must be understood from a domestic politics perspective (Lasserre, 2011) since they are externalization of domestic tensions. He underlines the fact that reforms over the use of water can be politically and fiscally costly. Indeed, a politician faces three options in case of a water shortage within his country. The first one is to increase the cost of water to create economic incentives to consume less of it. However, this option is costly politically if this leader wants to be re-elected. Otherwise, the leader can decide to launch the construction of dams or canals in order to better spare the water within the country. However, the option is fiscally expensive and might not fit into the budget of the state. Therefore, one last option remains, which is the seizure of an external water spring, while saying that this water was unfairly ripped out by a neighbouring country, in order to rally his people around-the flag. Politically, this option is the most viable one. Therefore, qualifying a war to be a war over water could be misleading since it suggests that conflict outbreak because of water scarcity whereas it is in fact often only a politician’s strategy. B- Water scarcity is not the causal factor explaining conflicts, unfairness from bad management of this resource is. Theories according to which conflicts are rooted in ‘scarcity’ or ‘abundance,’ are inherently flawed. The real reason why conflicts emanate from natural resources is the vulnerability of a state and its incapacity to fairly manage them. According to Alao (2007), this vulnerability is a function of the laws, structures, and practices of management of such resources, in particular the distribution of privileges and opportunities from them, but not of their degree of availability or of scarcity. He points out that scarcity of land led to violent conflicts in Rwanda but not in Gambia on the one hand, and that the abundance of diamonds occasioned war in Sierra Leone but brought stability in Botswana on the other hand. Instead, Alao explains that violent conflicts emerge because of the lack of credibility of institutions to provide a fair distribution of resources. This lack of credibility is due to three different factors. The first one is the perception of the fact that these institutions (such as borders) were built under the influence or the leadership of colonial powers. The power and the presence of Western MNCs in African countries contribute to the impression that African states are subordinated to them and therefore not working to defend their citizens’ interests. The second one is the mistrust of people regarding their leaders. Populations see the political elites as corrupted and as managing natural resources to serve their personal interests. Finally, even international institutions are not credible since they are believed to be skewed against developing countries. Therefore, their guidelines to better manage resources are not trusted. Overall, Alao argues that Africa has enough resources to meet the demands of its population. However, structures are not in place to ensure fair and equitable distribution among people, thus causing violent conflicts. Indeed, the notion of scarcity is socio-economically constructed and based on how an individual perceives his own level of access to a resource compared to the level of access of his neighbors. This is why one should not fear the multiplication of conflicts over water because of its supposedly ‘increasing’ scarcity, but about conflicts over the mismanagement of this resource. The Haratin and Fula people’s conflict on the banks of the Senegal river shows how the mismanagement of water and the lack of credibility of states to fairly share it among their citizens can lead to the emergence of violent conflicts. These two ethnic groups used to share their territories to raise their livestock. During humid periods, Fula people (Mauritanians) would benefit from the Haratin’s territory, while during droughts Haratin people (Senegalese) would go on the Fula’s territory (Santoir, 1990). However, after 1972, Haratin people settled down more or less permanently on the left bank of the river (in Senegal) because of a continuous drought, exacerbating tensions related to racism and to the gentrification of the banks. Eventually, in the 80s, numerous cases of inter-ethnic group violence were reported in Senegal. The Mauritanian states then used this violence as a justification to deport 70 000 Haratins from Mauritania to Senegal (Homer Dixon, 2001). This case study stages two of the three factors defined by Alao explaining the lack of credibility of institutions. First, it must be remembered that, despite the fact that the river officially delimits the border between Mauritania and Senegal, it is really porous and is considered by the inhabitants of the region as being a creation of former colonial powers. Then, elites in Senegal and Mauritania are unpopular and perceived as hoarding the wealth of these countries for themselves. Locals perceived the gentrification of the banks as the dispossession of their own land and resources. Their perception of scarcity increased and was one of the factors that led to these killings, even though there were enough resources for everybody. Therefore, this case study shows the empirical application of Alao’s fairness theory: wars will break up, not over water, but over its mismanagement instead. To conclude, this paper first analysed the arguments shared by the conventional wisdom according to which conflicts over water will increase exponentially in the next few decades because of the increasing scarcity of water in certain regions of the globe. However, it then showed that inter-states conflicts are not that likely to occur, notably because of the possibility for cooperation over water and of the numerous preconditions needed to be fulfilled for such conflicts to happen. This paper nevertheless did not overstate the impossibility to see these conflicts occurring in the next decades. Indeed, some water basins, such as the Nile Valley, seem to meet all the criteria for a conflict over water to happen. Moreover, the most important contribution of this paper is that it differentiates conflicts over water from conflicts over the mismanagement of water. I have shown that the real issue around water basin is not the scarcity of water per se but the fact that institutions are unable to commit to a fair distribution of this resource. Therefore, as long as these institutional issues are not solved, intra-state wars over the mismanagement of water will increase, because perceived scarcity will also increase. Future studies should aim at explaining how institutional problems can be solved considering the fact that, for these new institutions to be credible, they should be created by African States themselves since any Western intervention would undermine their action. Lasserre, F. (2011). Les Guerres de l’Eau. In F. Lasserre, & L. Descroix, Eaux et Territoirs: Tensions, Coopérations et Géopolitique de l’Eau (pp. 15-68). Québec: Presses de l’Université du Québec. Alao, A. (2007). Natural Resources and Conflict in Africa: The Tragedy of Endowment. Rochester: University of Rochester Press. Baldwin, D. A. (1997). The Concept of Security. Review of International Studies, 23, no. 01: 5–26. Brzoska, M. (2012). Climate Change as a Driver of Security Policy. In J. Scheffran, M. Brzoska, H. Brauch, P. Link, & J. Schilling, Climate Change, Human Security and Violent Conflict (pp. 165-184). Berlin: Springer. Gat, M. (2005). Nasser and the Six Day War, 5 June 1967: A Premeditated Strategy or An Inexorable Drift to War? Israel Affairs, 608–635. Granit, J. (2000). Swedish Experiences from Transboundary Water Ressources Management in Southern Africa. SIDA Publications on Water Resources. Haftel, Y. Z. (2007). Designing for Peace: Regional Integration Arrangements, Institutional Variation, and Militarized Interstate Disputes. International Organization, 217-237. Haftendorn, H. (2000). Water and International Conflict. Third World Quaterly, 51-68. Homer Dixon, T. (2001). Environment, scarcity, and violence. Princeton: Princeton University Press. Homer-Dixon, T. (1995, November 9). The Myth of Global Water War. Globe and Mail. Kameri-Mbote, P. (2007). Water, Conflict, and Cooperation: Lessons From the Nile River Basin. Navigating Peace, 1-6. Ramoeli, P. (2002). SADC Protocol on Shared Watercourses: Its History and Current Status. In A. Turton, & R. Henwood, Hydropolitics in the Developing World: A Southern African Perspective. Pretoria: African Water Issues Research Unit. Santoir, C. (1990). Le Conflit Mauritano-Sénégalais : La Genèse. Le cas des Peul de la Haute Vallée du Sénégal. Cahiers de sciences Humaines, 26(4), 553-575. Sharon, A. (2005). Warrior: An Autobiography. New-York: Simon & Schuster. Turton, A. R. (2004). Evolution of Water Management Institutions in Selected Southern African International River Basins. In A. K. Biswas, O. Ünver, & C. Totajada, Water as a focus for Reginal Development (pp. 251-289). New-Delhi: Oxford University Press. Waughray, D. (2011). Water security : the water-food-energy-climate nexus : the World Economic Forum water initiative. Washington D.C: Island Press. Wolf, A. (1999). “Water Wars” and Water Reality: Conflict and Cooperation Along International Waterways. In S. C. Lonergan, Environmental Change, Adaptation, and Security (pp. 251-265). Dordrecht: Springer. World Bank. (2000). Can Africa Claim the 21st Century? Washington D.C: The World Bank. Zeitoun, M. (2008). Power and Water in the Middle East : the hidden politics of the Palestinian-Israeli water conflict. London: I.B. Tauris.